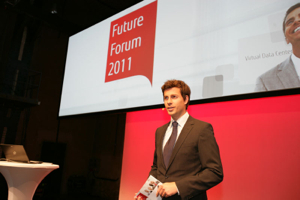 In September 2011, Fujitsu held their annual “Fujitsu Future Forum” and as in previous years, I had the honor of presenting the keynote speakers and guiding the participants through an exciting day. At three beautiful venues in Hamburg, Berlin and Düsseldorf, Fujitsu presented their latest offerings in products and services under the motto “Reshaping IT”. 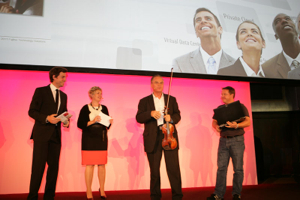 Among the many highlights on the big stage were comedy hacker Tobias Schrödel and the world renowned violinist Miha Pogacnik, who inspired and surprised the audience with his very own insights on music and business management.